Without a doubt, every fan of English literature has read at least one of Jane Austen's celebrated novels. Her works are inextricably linked to the Regency era of British history. All six of her finished novels were published during this period, making them representative Regency romances. The Regency era lasted a mere nine years, from February 1811 until January 1820. It was marked by romance, style, and etiquette. In 1810, King George III was taken seriously ill and was declared unable to rule because of mental incapacity. The Regency Act was passed the following year making his son George Prince Regent to rule in his stead. The Regency lasted until George III’s death in 1820 when the Regent became King George IV and was able to rule in his own right. Although Austen wrote her novels at a young age, her ideas were far beyond her years, which still hold true today. A master at taking conventional life and making it extraordinary, Austen began her most famous piece, Pride and Prejudice, at the early age of 20 which became an instant success almost immediately and continue to be very popular today. Henry Thomas Austen (1771–1850) was Jane’s favorite brother and was the sibling most like her in looks and temperament. He was witty and enthusiastic in whatever he did; the eternal optimist, though success did not always find him. He was most influential in allowing Jane to publish her works. Not only was his home available for her to stay in during her trips to London to work with her publisher, these visits also gave her an insight into society life that she would not otherwise have had, furnishing settings, events, and characters for her novels to come. It was Henry who saw to the publication of Persuasion and Northanger Abbey after her death, and it was Henry who wrote the brief, but loving biographical notice which prefaced these two novels and provided the world with their first glimpse into the life of this author. When it was announced that Jane Austin would appear on the new ten pound note in 2017, few were aware that a ten pound Austen banknote already exited—issued by her favorite brother. Handsome, clever and enterprising, Henry Austen founded a bank business and charmed his way into the top rank of aristocratic society before going spectacularly bust in the financial crisis of 1816. He left an enduring legacy, however, for it was Henry who supported Jane’s dream of becoming a published author. 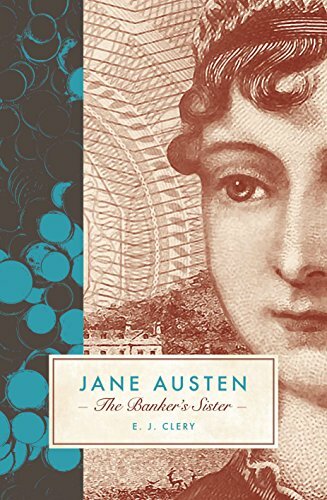 In E. J. Clery’s new book, Jane Austen: The Banker’s Sister, the distinguished literary critic, professor and cultural historian explores new methodology to the study of the celebrated novelist, revealing a tantalizing look into how Austen’s classic works were shaped by her close relationship with her brother, as well as the financial scandals and disasters of the Regency era. Despite the fact that there are a plethora of biographies on Jane Austen, there are some noteworthy gaps in what is known about her life and works. Clery’s masterful and scholarly interpretation of Austen’s family dynamics, political links, and financial successes and failures provides an interesting and fresh approach to the study of this illustrious novelist’s life and legacy.